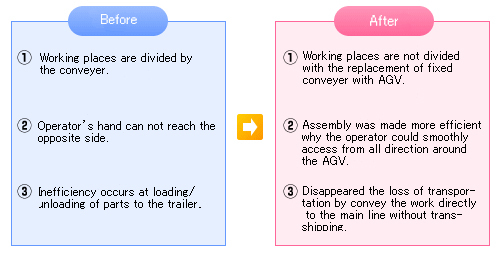 Assembly of automobile suspension | AGV (automated guided vehicle), automatic guided vehicle system Aichi Machine Techno System Co., Ltd. This is a Kaizen, improvement that AGV is used as a workbench itself in an assembly line of automobile suspension. then improved drawbacks taking advantage of the launching of new model.